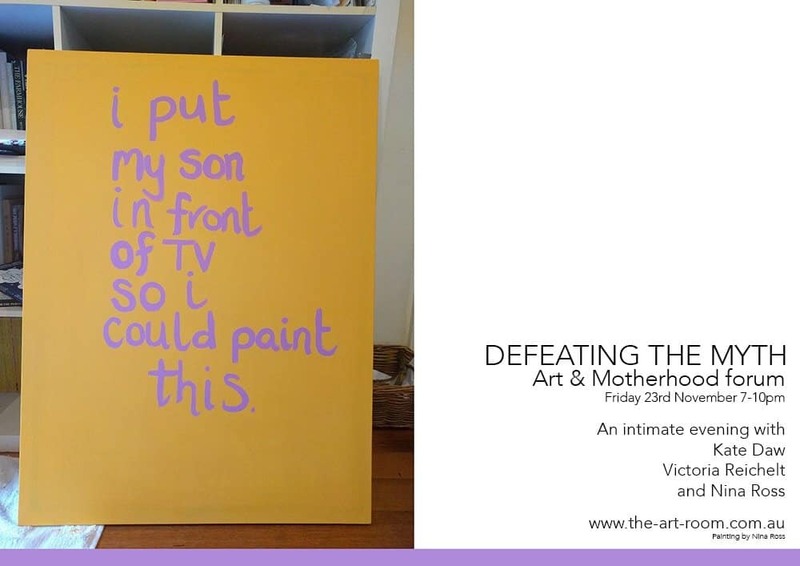 We’re thrilled to have Kate Daw, Victoria Reichelt and Nina Ross join us for DEFEATING THE MYTH, a conversation about art and motherhood this Friday 23rd November from 7pm. It’s going to be a wonderful evening with Kate, Victoria and Nina introducing their practices with us, generously sharing their experiences in a panel discussion, and an open conversation that we invite everyone to contribute to. This special event also gives you the opportunity to connect with your peers and strengthen your community. Kate, Victoria and Nina have children ranging from toddlers to teenagers and this forum will resonate with not only new parents who are trying to find their way, but all mothers. Please note that children are welcome to attend. There will be time at the end of the evening to mingle and we understand if you need to leave prior. DEFEATING THE MYTH is on this Friday 23rd November from 7pm. Seats are limited, food and beverages are included, for all the details and to book CLICK HERE. You can learn all about Christo's latest installation on his website HERE.